Resolve to Cut Plastic Bags from Your Life in 2016 | Patricia DeMarco Ph.D. 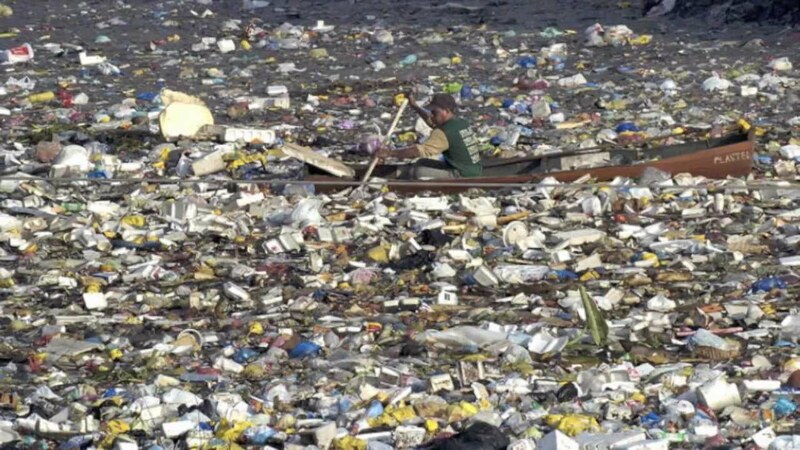 Between Asia and North America is the Great Pacific Garbage Patch, which is about twice the size of continental United States. Located inside the North Pacific Gyre, the Great Pacific Garbage Patch is filled with at least 100,000,000 tons of micro plastics,marine debris, and fishing gear. A gyre is essentially a natural vortex in the ocean. Lots of the trash we do not throw away often ends up in the Great Pacific Garbage Patch by wind and ocean currents. The trash is severely harming the marine ecosystems of living things. Plastics leach Bisphenol A , an endocrine disrupting chemical. Plastic bags have been around for about 30 years. The average American family takes home 1,500 plastic bags a year (Natural Resources Defense Council). Americans use and throw away 100 billion plastic bags every year, which requires 12 million barrels of oil per year to manufacture. (The Wall Street Journal). This is a huge environmental problem because the plastic is not biodegradable, a single plastic bag can take 500 years to degrade. The ocean ecosystem is especially hard hit by the vast accumulations of plastic debris. Sea animals attempt to eat plastic debris, resulting in choking, or intestinal blockage and death. Sea animals can become caught in plastic debris, such as the webs that bind six-packs of soda or beer. Toxic pollutants absorbed, and transported in plastic waste, when consumed by marine animals become part of the human food chain. 80% of the marine garbage originates on land. It is time to stop using the ocean as a garbage bin. Carry your own re-usable bags. For groceries, it is simple to carry reusable bags, some even adapted for cold and thermal insulated goods. Keep a small collapsable nylon bag for miscellaneous purchases. Chico makes a wide variety of them, and many places sell them in styles from whimsical to sturdy. Even the French string bag takes little space in a purse or pocket. Get in the habit of carrying bags to transport purchases. Use glass containers or jars for storage. These can be used repeatedly, and are recyclable when you finally need to discard them. They do last a very long time. I have a row of glass topped wire bale canning jars from the 1920’s to store bulk purchased items like beans and cereals. Use reusable storage containers for things like bread and baked goods. Recycle. When you must use plastic containers, choose ones that can be recycled, and diligently recycle. If your community does not have a municipal recycling program, petition to have one started. In America, only 0.5% to 3% of plastic bags are recycled. Take Responsibility. Set a specific goal to use less plastic packaging. Make a conscious effort to purchase goods that are not over packaged. For example, buy bulk foods in re-usable containers. Decline to take a bag for items that can be easily transported without a bag. Hold Producers Accountable. Customers can contact producers to ask for less packaging and more recyclable materials in packaging. Ultimately, there will need to be a change in the culture of hyper-packaging everything. It is important to begin thinking through the fate of what we buy. Do we really need all this stuff? Know that we do really need a healthy living ocean ecosystem! The only way to keep garbage from ending up there is to control what we throw out. Join me in taking a pledge to Cut Plastic Waste in 2016! Categories: Uncategorized | Tags: ocean plastic gyre, plastic bags, recycle | Permalink. I think it is crazy how much the average family takes home in plastic bags each year. I had know clue the toll this took on the environment. I didn’t know that it took that much oil to make this plastic.